Capital City Church is located approximately 3 miles from Florida State University and approximately 6 miles from Downtown Tallahassee! We are a caring and loving church community. We like the term community because we feel that it best describes what we should be as the body of Christ! We believe in healing, wholeness, restoration, and deliverance. A part of our mission is to be a healing community to a wounded world! Capital City Church is theologically conservative, emotionally expressive, vision focused, and relationally interconnected. Capital City Church is a Spirit-empowered church with many people from all backgrounds. You can read more about what we believe here. 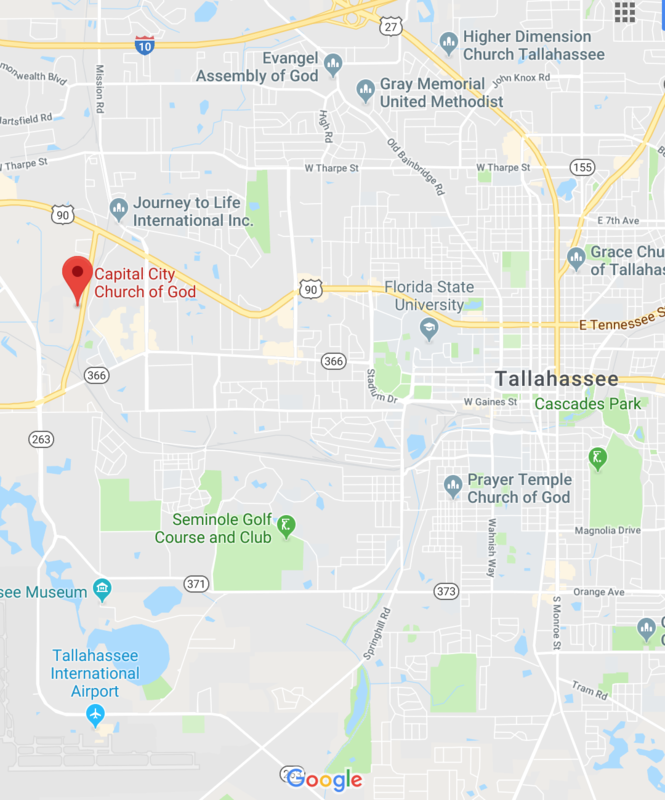 Capital City Church is located just over 3 miles away from Florida State University and just over 6 miles away from Downtown Tallahassee! We are a caring and loving church community. We like the term community because we feel that it best describes what we should be as the body of Christ! We believe in healing, wholeness, restoration, and deliverance. A part of our mission is to be a healing community to a wounded world! Capital City Church is theologically conservative, emotionally expressive, vision focused, and relationally interconnected. Capital City Church is a Spirit-empowered church with many people from all backgrounds. You can read more about what we believe here. The first step in being a part of what God is doing at Capital City Church is to join us for Sunday worship experiences. Our current meeting time is at 10:30am on Sundays at 862 Blountstown St. Childcare is provided during our Sunday morning services. You will find a relaxed and friendly atmosphere with exciting worship music and a practical and relevant message. For more info click here. Our Kids ministry (CCKids) is designed to teach your Kids about Jesus while having fun! We have a whole building on campus dedicated to Kids from infants to 5th grade! To learn more click below.